We loved our honeymoon! Here's a wedding post for this February month of love! Patrick and I wanted a very relaxed, somewhat local honeymoon. We didn't want the stress of catching flights to somewhere exotic and then feeling pressure to do all the fun things in that locale. Charlottesville, VA was the perfect spot for us. In Charlottesville we stayed in some cozy B&Bs and had some fun, low pressure attractions throughout the area to do. 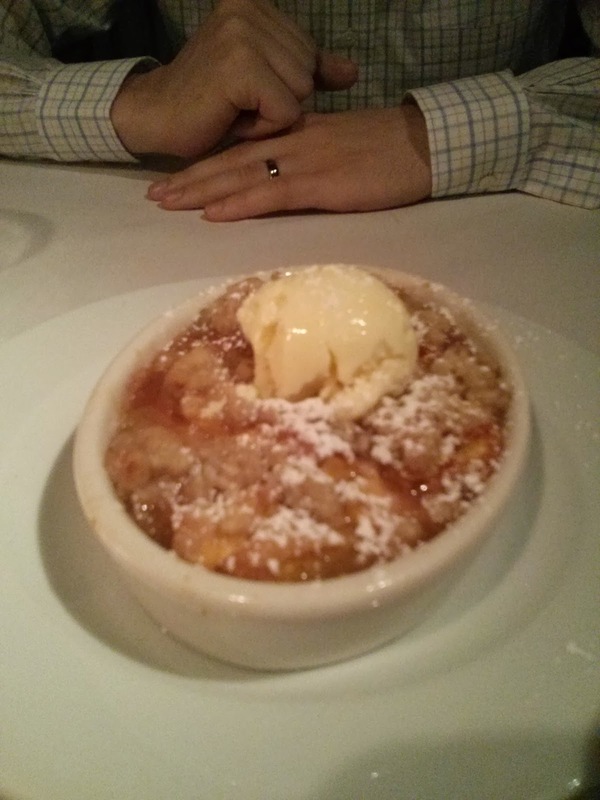 So sit back and relive our honeymoon with Patrick's retelling below. 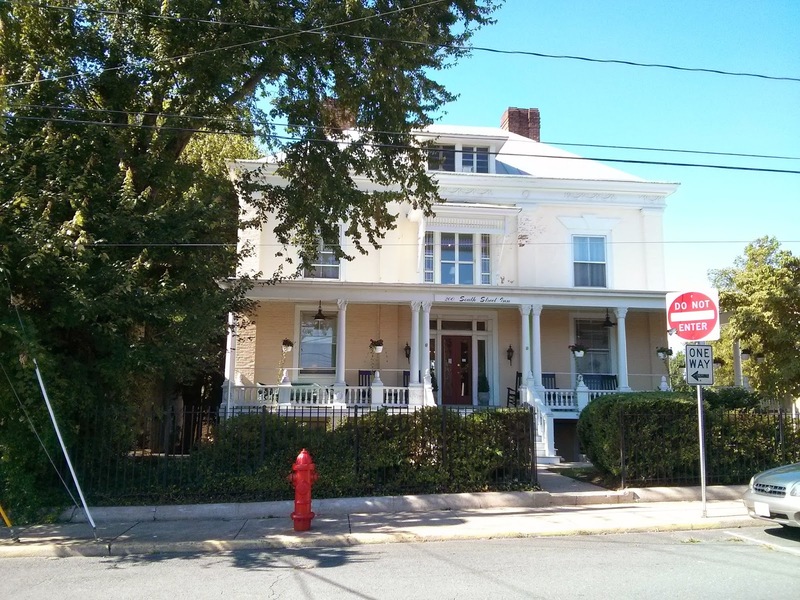 If you're interested in a trip to Charlottesville below you will find more details and links for said attractions, B&Bs, and restaurants. 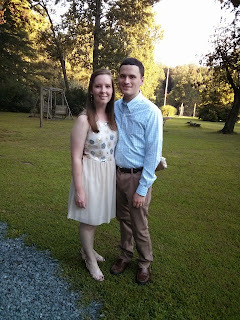 After enjoying a quiet night at home Sunday after the wedding, we were on our way to Charlottesville. 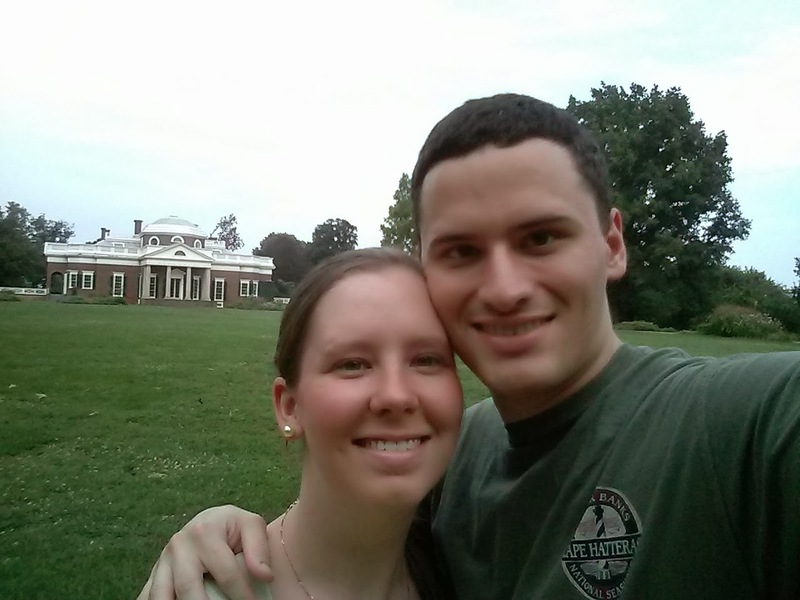 We left just in time to check into our B&B and head straight to what might be Charlottesville's most known attraction and a must-see for us, Thomas Jefferson's Monticello. We enjoyed the evening Monticello tour which was very thorough and taught us a lot about Jefferson and life in those days. It was pretty late by the time we got back, but luckily for us the kitchen was still open at Bang!, an Asian tapas restaurant conveniently across the street from the B&B. The weather was beautiful and we had fun picking out small plates and eating on the front porch for our first honeymoon meal. Finally, we retired to our room at 200 South Street Inn. The location was wonderful, a short walk from the downtown pedestrian mall, and they always had fresh-baked oatmeal chocolate chip cookies at the front desk. On Tuesday we made a point of exploring the UVA campus and downtown Charlottesville pedestrian mall. You can never learn too much about Thomas Jefferson! We checked out the Rotunda and Academical Village for a while before heading to lunch. For lunch we selected The Virginian on the recommendation of Christine. I had a local beer and a buffalo chicken sandwich, and I can certainly see why this place has been around so long. Taking the bus to campus had been somewhat of an ordeal, so we took a nice walk back toward the pedestrian mall. 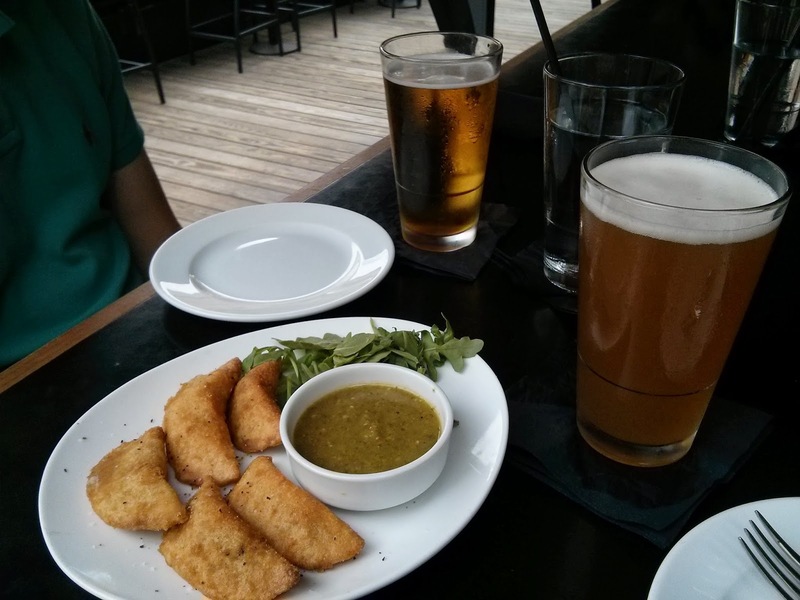 We explored a number of shops and then found the attractive Skybar Rooftop lounge where we stayed for happy hour. It was a very nice place to relax on a summer afternoon and feel like we're on vacation. Since the hour hadn't quite been happy enough, we got back to the 200 South Street Inn in time for their daily wine and cheese afternoon reception. 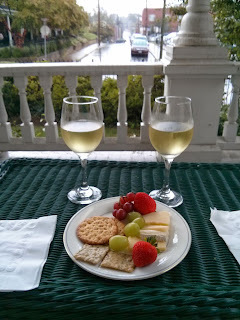 With perfect timing, a rainstorm started right after we got in, so we took our wine and cheese out to the front porch to enjoy the scene. As you might expect after all that food, we were not hungry again for quite a while, which conveniently gave time for the rain to stop before we headed out for dinner. When we were ready, we walked over to Hamiltons' at First and Main. We had another delicious dinner outside and celebrated with Champagne. Wednesday morning we checked out of the South Street Inn and headed out to the Blue Ridge where we could spend the afternoon until we were able to check in to our next B&B. Our first stop was Luray Caverns, which was even cooler than it looks, especially for someone who's never been in a real cave before. We were hungry after hiking through those caverns so we headed into Luray afterwards for lunch at Gathering Grounds Patisserie and Cafe. It was a really cool cafe with a nice atmosphere and I would recommend it to anyone visiting the caverns. After lunch we decided we would head south back to Charlottesville by way of the Blue Ridge Parkway, where we stopped a few times for overlooks and spotted a bear and some deer. 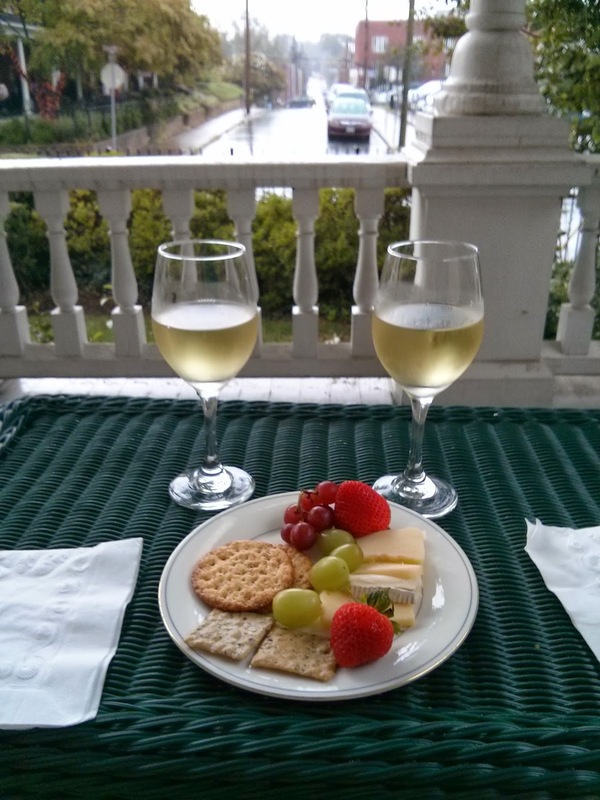 We arrived back in Charlottesville in time to check in to the B&B and meet the owners over some wine and cheese before heading to dinner at The Local. 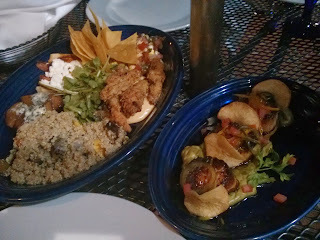 The food was good and we enjoyed seeing a different part of downtown. 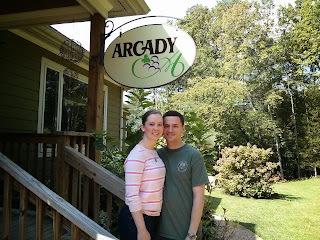 After dinner we headed back to Arcady Vineyard & Bed and Breakfast. 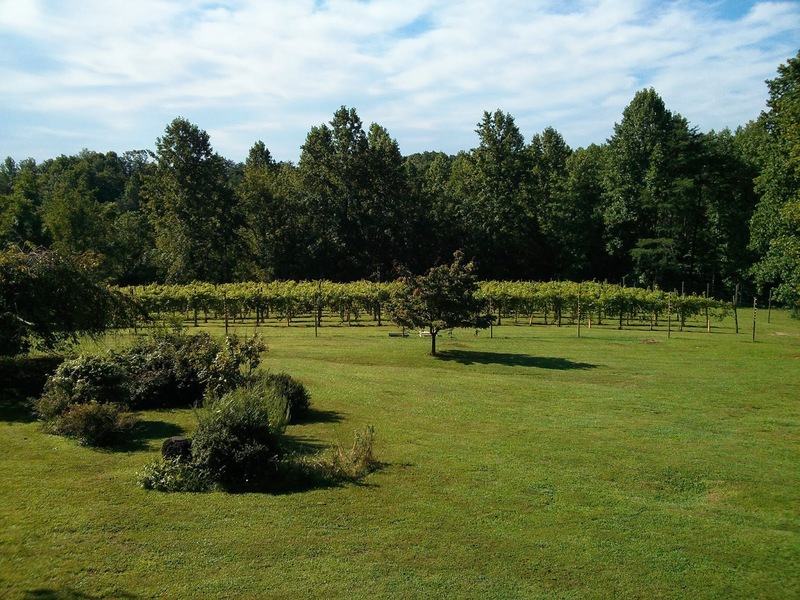 This B&B is run by a wine enthusiast couple who do it all - they cook breakfast, lead regional wine tours, socialize with guests, and even maintain a small vineyard. Nightly port and chocolate. While supply lasts, the port is made from the grapes they grow. One of the main attractions of Arcady for us was their wine tours, which gave us a great activity for Thursday. We actually selected a hybrid winery/brewery tour, so we went to see three wineries and a brewery. We were very impressed with the wineries. 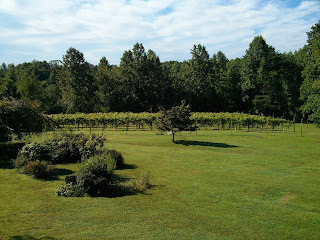 They all had beautiful grounds and Blue Ridge vistas, and of course, tasty wines! Our guide drove us around and dropped us off for dinner at night so we were able to enjoy the wine without a second thought. Our first stop was King Family Vineyards, which has some beautiful grounds that host polo matches on Sundays. Our favorite here was the Crozet rose. I'm ready for some polo! Pollak Vineyards has a large patio with a scenic view of a pond and the mountains. Our favorite wine was the Viognier. 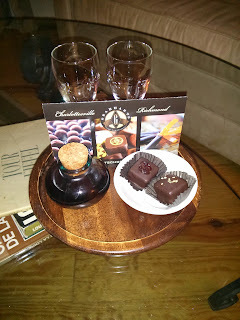 The guide from the B&B provided us with this fruit and cheese platter. 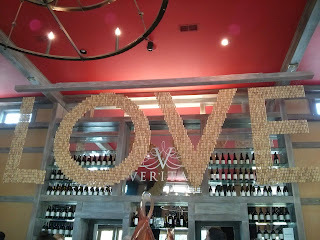 Veritas Vineyard & Winery has an awesome tasting room. We liked their red blend and Viognier. For our final stop we went to Blue Mountain Brewery and enjoyed a flight with all of their beers. It was a relaxing final stop with another beautiful view. It was also nice to see the brewery after having enjoyed some of their beers in downtown Charlottesville. Before our tour we needed lunch in a hurry and stopped at Salt Artisan Market. It's a nice little sandwich shop and we recommend it if you need something quick around Monticello. We selected C & O Restaurant for dinner after the tour and our final meal out for the trip. It was a perfect ending. Friday morning we packed up and left, but not before making a brief stop at Carter Mountain Orchard. 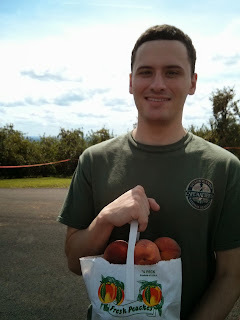 We enjoyed the views from the top and their gift shop, and picked up a half peck of peaches before making the scary drive back down the mountain. Peaches! Now what did we make with those? 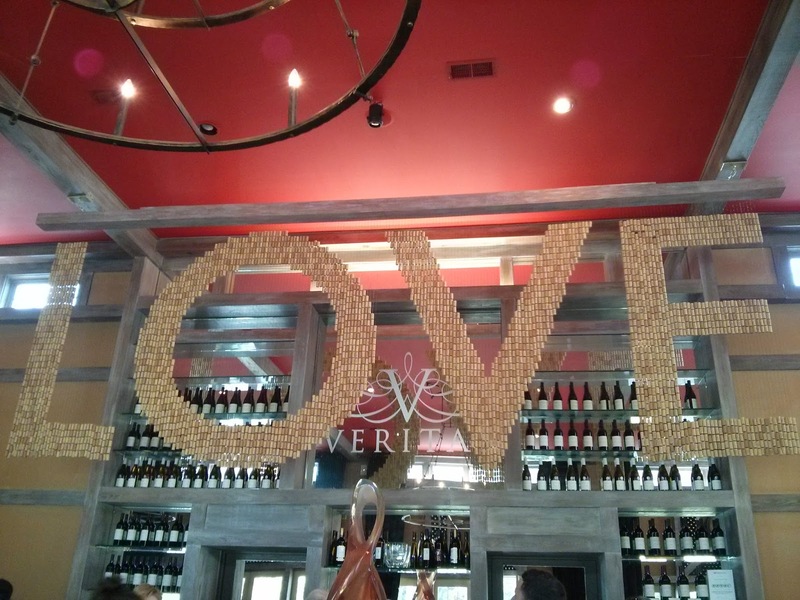 After seeing it for ourselves, we must say that Virginia is indeed for lovers. Did we miss any of your favorite parts of Charlottesville? Love this. Looks like such a fun relaxing trip for your honeymoon! Seems like you had a perfect honeymoon trip. As always, I love the pics!